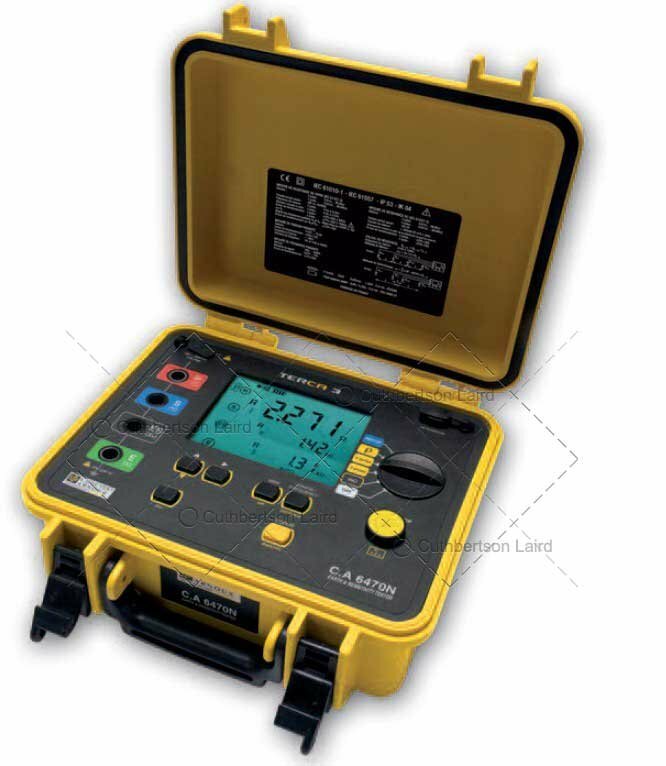 4 in 1 tester: earth resistance and coupling, continuity and resistivity. Ergonomic, comprehensive and accurate, the C.A 6470N offers direct access to all the measurements on the front panel by means of a rotary switch. Compact and designed for use in the field, the C.A 6470N is rugged and leakproof. To simplify the connections, the 4 terminals for connection to the stakes are colour-coded. The C.A 6470N includes a large backlit LCD screen and a rechargeable battery with an external charger for connection to the mains supply or to a vehicle cigarette lighter. Resistivity (Wenner + Schlumberger methods). Range: 0.01Ω to 99.9 kΩ (3P), 0.001Ω to 99.99 kΩ (4P). Colour-coded connection terminals to prevent errors. Communication: optical / USB link. Rugged leak-proof and site-proof box. Dimensions: 272 x 250 x 128mm. Chauvin Arnoux CA6470N Warranty: 1 year. 1 external mains charger, data export software + optical / USB communication lead, 5 operating manuals (one per language) on CD-ROM, 5 simplified operating manuals, each in a different language, 5 descriptive labels, each in a different language.